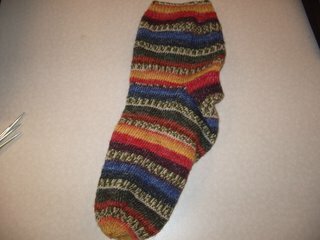 Here's the finished sock...I'm not happy with the toe grafting, but I'm going to leave it and do the second one the same way. Why, you ask, would someone who is a perfectionist leave something they don't like? Well, one, I'm tired of messing with this sock, particularly the toe part (I had to graft that sucker 3 times!) and two, I've already started on the second one...see? 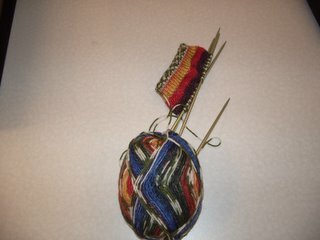 That was this morning's progress...there's about another half inch to three-quarters added, since I worked on it during lunch. My goal is to finish it this week...I would like to be working on it through Saturday, and then finish it and start on another project. And I have oh, so many! I'm going to start on my purple sweater...the one I completed and then took out. I didn't take any pictures of it, but I can assure you I will this time! I'm trying to complete one project a month, give or take. January's project is socks; February's will be that sweater, and I also have a baby blanket to do in February. If the sweater goes into March, that's ok. I should still be able to finish it before the weather heats up too much to wear it (it's acrylic and it gets uber hot). I put all the projects on my Palm Pilot (I'm being very digital these days - go figure) and I have them through May, I believe. There might be several more pairs of socks done this year. I have a skein of Magic Stripes that needs knitting, and oh! There's also a pair of kid socks in my future! I bought a one skein-er at a LYS, and thought I'd do anklet socks with it! I hope there's enough. If not, I might do something funky with it, but what I haven't decided. I'll cross that bridge when I get to it. Well, I should go clean now...besides, this computer's uber slow. I found a great one for $250; I just don't have $250 right now. Someone want to give me $250 for a new computer?! I'll be more than happy to take your money! =0) Just kidding! In a couple of months (or sooner I hope) I'll be able to order it. It just takes some time (and not traveling). I don't think people realize how much money it takes to travel around here. Gas is so expensive, and so is food. Oh well...hopefully another progress report tomorrow (with pictures)!